Hello and welcome to my blog! 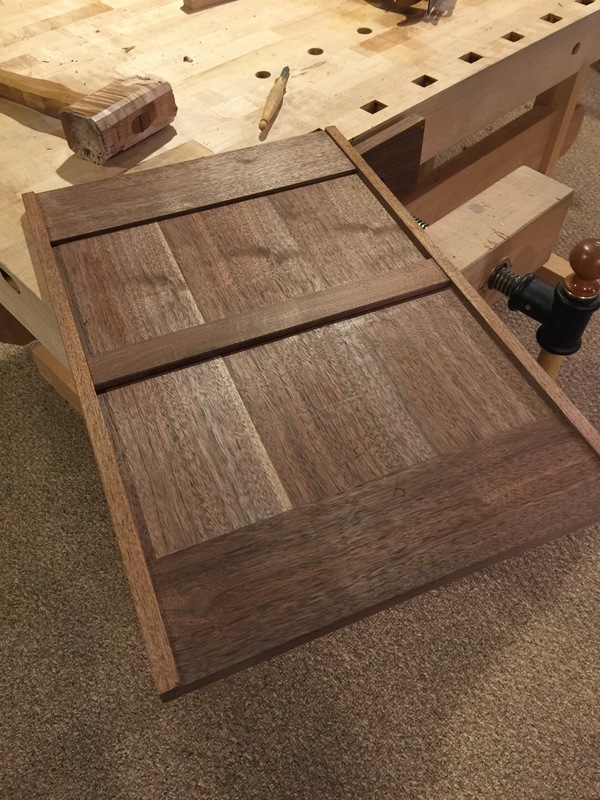 This post completes a series in which I’ve detailed the build of a wall hanging media console made in American black walnut. This final post will cover the process of building moveable shelves for the case interior to complete the building stage, readying it for installation. I’ve planned adjustable shelves for this cabinet to accommodate a variety of electronics which may be installed, either right away or down the road. Luckily electronics are getting smaller as time goes on, so it is unlikely that the shelves will need to be moved, but best to plan for all foreseeable situations. I’ve cut and thicknessed the panels a while back, and happily they remained perfectly flat even without support. I had originally intended to use them as door panels, but thought better of it when the option was made available to use wide stock for the door panels. I altered their size just slightly for this new purpose. Trimming them to width using a plane. After bringing them down to size, the next step was to cut a rabbet around their perimeter. An old english plane that I restored comes in handy for such a purpose. The panels are set aside and work begins on the rails, first grooving them to accept the panels then cutting tenons. The tenons will be haunched, but I’ve left them at their full width for the time being. Once the panel can be partially assembled, marks are transferred to the stiles which are then grooved to accept the panel and mortised to receive the rail tenons. I’ve planned haunched tenons and my approach to cutting them is taken in steps, first determining their length and transferring the baseline mark to the stile. After setting their length and marking the base line, I use a kebiki gauge to complete the layout. The stiles, having been grooved, required certain care in mortising. I found a strip of plywood to fit into the groove to use as backup and cut the mortises from the outside in, first drilling a hole then chopping the waste toward the hole. Care had to be taken to line up each cut exactly as I had zero room for error, the tenons were sized perfectly to the grooves and the grooves were exactly the size of my chisel. Once the mortised stiles were placed back onto the assembly, I could transfer marks to my tenon and then cut the haunch. The reason for retaining a haunch is two-fold, it aligns the stile to the rail over the full width of the rail and also allows for a full length groove in the stile so that a stopped groove can be avoided. Stopped grooves being the bane of all woodworkers. After rip cutting the tenon to width, I then crosscut to remove the waste and set the height. Once a full assembly could be made, I determined that the shelf needed a batten support in its center. I decided to cut dovetailed battens to fit into the panels, I’ve detailed the process required quite recently in the door building post. A batten was cut and fit into each panel, then stub tenons were cut to fit into the stile. Prior to reassembling the shelf I cut chamfers around the inside members of the assembly, aiming to accentuate the difference between panel and frame to minimize the visual effect of the expansion gaps at the panel sides. After assembling the panel, the next step was to remove the protruding horns from the stiles and trim back the tenons until flush. The stiles are always left long until the assembly is complete, the additional length helps keep the stile in tact while mortises are cut. I was able to make use of a tool that has sat on a shelf until recently. I have recently set it up for use and I am happy to find that it works wonderfully, the blade which is 30-40 years old and made by Kikuhiromaru cuts exceptionally well. This kanna is called the ‘Naga-dai-Kanna’ and typically used by cabinet makers who use them in conjunction with a shooting board arrangement. The naga-dai-kanna is a welcome change from the iron body planes I’ve been using. The corner detail, showing the expansion joint and corresponding chamfers. Finally the stiles are finish planed on the back side of the panel. Care was taken to make the height of the stile taller than that of the rail which is thicker than the panel. I wanted to make a 3/4″ thick assembly, but ensure the finished shelf would be lightweight. The finished assembly is now installed into the case. I made up a drill template from plywood and used it to drill holes for the support sleeves. The support sleeves are installed using a wooden handled driver to press-fit them into place. The press-fit, with respect to wood, is very light, but enough to keep them in place. The sleeves are tapped into place. The panel is held in place by steel pegs which insert into the sleeves. They’re easily moved to next set of sleeves to accommodate larger electronics placed either top or bottom. I’ve left a space behind the shelf to allow wires to pass by. A small recess was cut into the rails, setting the pins into the rail to prevent back and forth movement. With the cabinet now complete, I’ve been slowly shellacking the case and parts. I work shellac onto the surface much like one would wipe on an oil finish, when it starts to build I move on. It will lose the extreme luster after a day or two and I can reapply additional shellac to build the surface. I usually stop right as it begins to look like a film finish. I mix shellac using alcohol and shellac flakes. I enjoy the look of super blonde on most woods, so I keep that on hand. I hope that you have enjoyed following along with this build and I very much look forward to your comments. I’ve installed the cabinet and have photos of it in place. Beautiful work! Can you go into more detail regarding how you apply the shellac? I am a novice woodworker trying to achieve a similar effect on some simple picture frames I have built, but I am finding that I do not know when it is time to stop applying more coats. If I keep going until the sheen evens out I find I start to see lap marks where strokes meet in the corners of the frame, even though I think I am applying the shellac correctly (padding it on with continuous strokes “like an airplane coming in for a landing then taking off again”). Thanks! Hi Nick, Thank you for following along with the build and thanks for your comment! Shellac is s tactile experience, it will become more intuitive with continued exposure. I do a couple things to make the process a bit easier, first always keep the pad damp. I keep the bottle nearby and simply apply more after every one-two strokes until I’m building up enough that I am burnish without the pad sticking. Don’t linger, keep the pad moving or airplane it off the surface. If you get a sticky spot just re-dampen the pad and work over it lightly to settle the surface. Thanks for the advice, I will keep those points in mind! As you stated I think I mainly need to keep practicing, which I will hopefully have an opportunity to do next week if I can get some things assembled over the weekend. I would like to become skilled at applying shellac both because it looks beautiful and because it is very pleasant to use a finish that is as close as you can get to non-toxic when dissolved in grain alcohol. One last question: what cut of shellac do you use? I have been using a 1 pound cut and I am wondering if that is too thin. Keep at it, the efforts will pay off! I use a two pound-ish cut. Usually I just eyeball it and adjust if needed. 1lb may be too light and not building up quickly enough, try adding enough to make it 1.5lb cut. 200 years ago they built it all by hand just like you did this masterpiece. With so many sophisticated modern machinery available we still choose to work with our hands instead. I believe the hardest part of hand tool woodworking is not the labour nor the back ache or the sweat off your brow, but pricing your work. What price tag justifies skill. Well done Brian. Thanks Salko! Very much appreciated, you know well my passion! Thank you for taking the time to share. So many of us learn so much reading blogs then putting what we read to practice. My pleasure! Thanks for following along with the build! Just had a great time reding through this blog series. Each time I revisit your blog I am impressed with the accuracy and attention to detail that is all over your work, tools and workshop. If Krenov had kept a blog back in his days this probably is what it would have looked like. Thank you for sharing all this. I, too are uncomfortable using shellac. Like it a lot but usualy paint it on and then sand etc. If you one day have the camera out a blog post on this subject would be much apreciated. Both the genneral technique and especially how you deal with corners, details etc where rubbing can be difficult. On this cabinet I realy like the sliding doors. How did you settle on that design and what where your thoughts in doing so? Thanks Ty, much appreciated! I’ll make an attempt at documenting that next time it comes up. I wipe on shellac and so I typically smush the rag into the corners, then blend the excess back into the panel. I like sliding doors for a few reasons. There is no hardware to concern myself with and so I do not need to mortise in hinges or catches. Next, the tracks actually help to retain the door’s shape. A door inside of a track will not likely twist or otherwise distort and in that same vein they never sag. Finally I like that they do not consume any additional space in the room, they can be planned tightly into spaces without consideration for door swing. While this is often a non-issue for cabinetry in this format, it can be an issue with wide/tall built ins. I put one in the shop recently that would have required 3′ of door swing, or 4 doors. Instead I was able to make two sliding doors and did not need to make any planning efforts outside of the facade. Newer thought about sliding doors not sagging. Can see that opens a lot of design options. Perfect since i am at the drawing table stage on a cabinet with sliding doors. Thanks for the tip! My pleasure! Best of luck with the cabinet.